Try this scrumptious Deviled Egg Potato Salad. 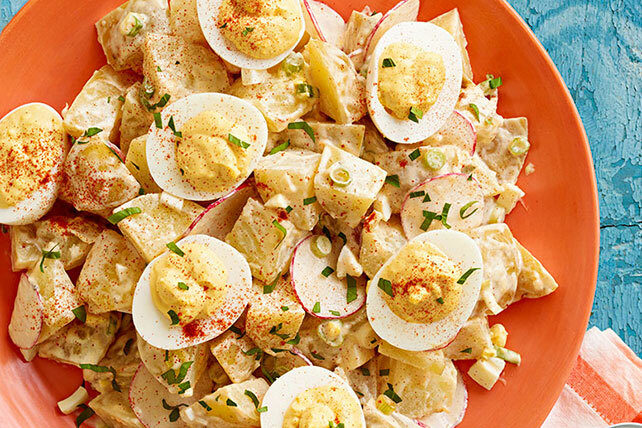 Two crowd favorites—deviled eggs and potato salad—come together in this flavorful potato dish. Cook potatoes in boiling water 10 to 15 min. or just until tender; drain. Transfer to large bowl; cool. Mix dressing, mayo, mustard, lemon juice and 1/4 tsp. paprika until blended. Cut 4 eggs lengthwise in half. Remove yolks; place in small bowl. Mash with fork. Add 3 Tbsp. dressing mixture; mix well. Spoon into egg whites. Chop remaining eggs. Add to potatoes with the onions, radishes, garlic and remaining dressing mixture; mix lightly. Top with deviled eggs, remaining paprika and parsley. You'll know it's a special occasion when you get to enjoy a serving of this delicious salad. For a chunkier potato salad, use waxy potatoes such as red potatoes or quartered new red potatoes. This delicious salad can be prepared ahead of time. Refrigerate up to 24 hours before serving.